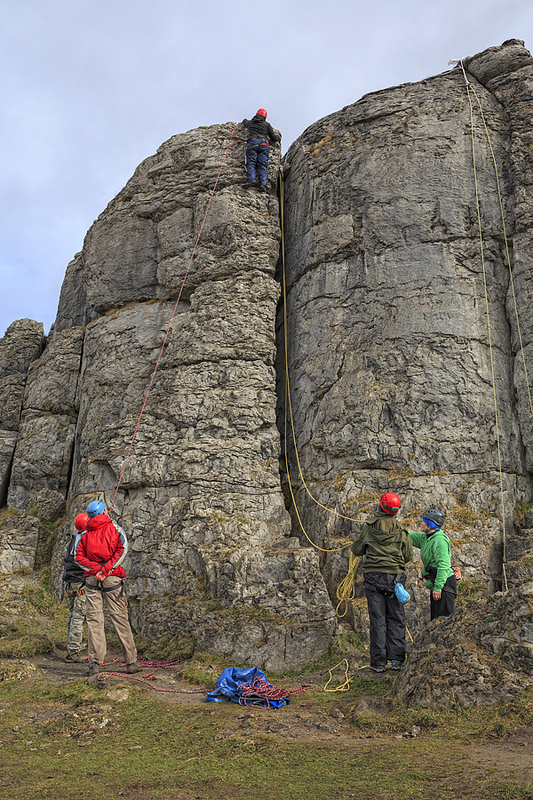 The Burren is the mecca of climbing in Ireland. 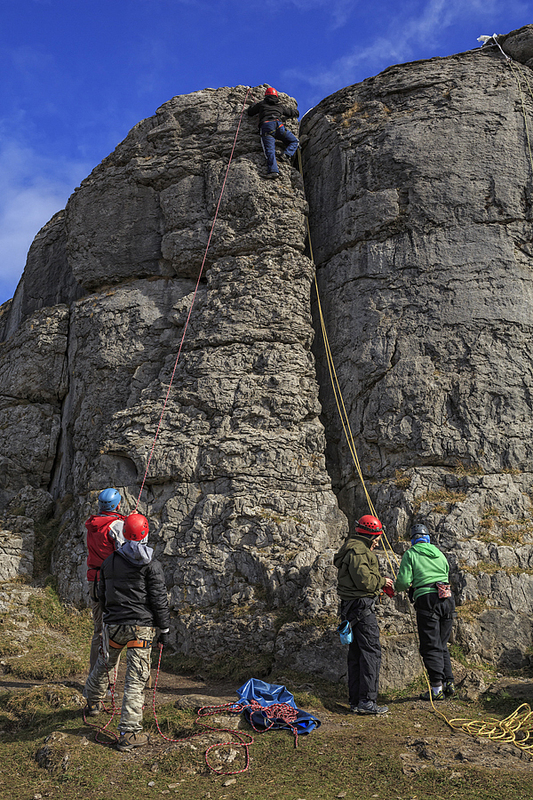 Its unique limestone landscape is a treasure trove of climbing areas with a vast variety of routes and types of climbs. We generally use two main areas in the Burren. The Ballyryan and Ailladie climbing areas are located on the Lisdoonvarna to Ballyvaughan road (L54), 11km north of Lisdoonvarna and about 1.5kms beyond where this road reaches the coast. The approach from the north, Galway direction, travel through Ballyvaughan staying to the right at the t junction. Pass through the village of Fanore and after 4 km as the road swings to the left and the open ocean appears in front of you, there is a small car park on the left. We meet here. Coming from the Doolin direction get onto the R479 road and drive north from Doolin for about 10 minutes and get onto the R477 coast road heading north for 10 minutes and you will see the climbing area along this road on you right hand side, and just after this there is a small car park on the right also. We generally meet at the car park and walk to the climbs we are using that day. This little crag is comprised of pillars, corners and chimneys and can be seen clearly from the road. From the car-park of Ailladie (Stone Wall area) walk south for a few hundred meters until the roadside crag swings sharply east and becomes a bit higher. 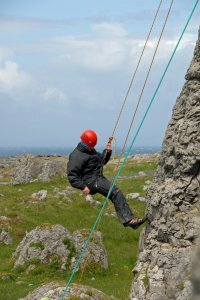 Ailladie (Aill an Daill - The Blind Man's Cliff) is an 800m long limestone sea cliff with routes varying in height from 8m to 30m. It lies out of sight below the Lisdoonvarna to Ballyvaughan road (L54), 11km north of Lisdoonvarna. From the layby where cars are usually parked a short walk northward along the edge of the cliff brings one to a grassy ramp which leads down to a 3m step. This descent is used by local fishermen and is usually equipped with some rope and two metal spikes. Below this are the Dancing Ledges - an extensive non-tidal platform from which routes the first 90+ routes can be reached. Another 20+ routes are in the Mirror Wall area and access depends on the tide. 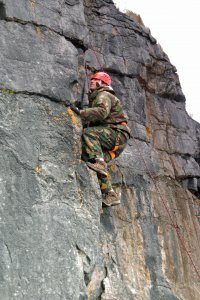 For all routes further south descent is by abseil. The rock is steep with sharp incut holds and most routes take crack lines. Protection is reasonable. Many of the routes are subject to change due to high seas and winter storms. Boulders are shifted around from year to year and consequently the grades of the starts of routes can vary considerably.